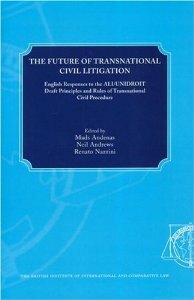 This book addresses the problem of transnational civil litigation by presenting the responses of English law to the project between the American Law Institute and the International Institute for the Unification of Private Law (UNIDROIT) to draft a set of Principles and Rules applicable to transnational civil litigation. Senior members of the judiciary and leading practitioners from Europe and America examine specific issues of transnational civil litigation from the perspective of the English and Welsh Civil Procedure Rules 1998. The most prominent problems of cross-border dispute resolution are addressed by the book, such as those relating to: presentation of evidence and documentary disclosure; case management; appellate procedures; interim measures; the relationship between ADR and formal litigation; and the need for further harmonization of civil procedure on a global scale. The analyses in this book represent a significant contribution to scholarship in an emerging field. Core problems and new directions in transnational civil litigation are unearthed for the benefit of the private international lawyer by means of a comparative approach to both civil and commercial common law systems and the American and English models of civil litigation. "Future of Transnational Civil Litigation"